Tagging in FeedDemon: What Would You Like to See? I’ve been adding support for tagging to FeedDemon, and I wanted to pass the new features by FeedDemon customers to see if I’m missing anything. 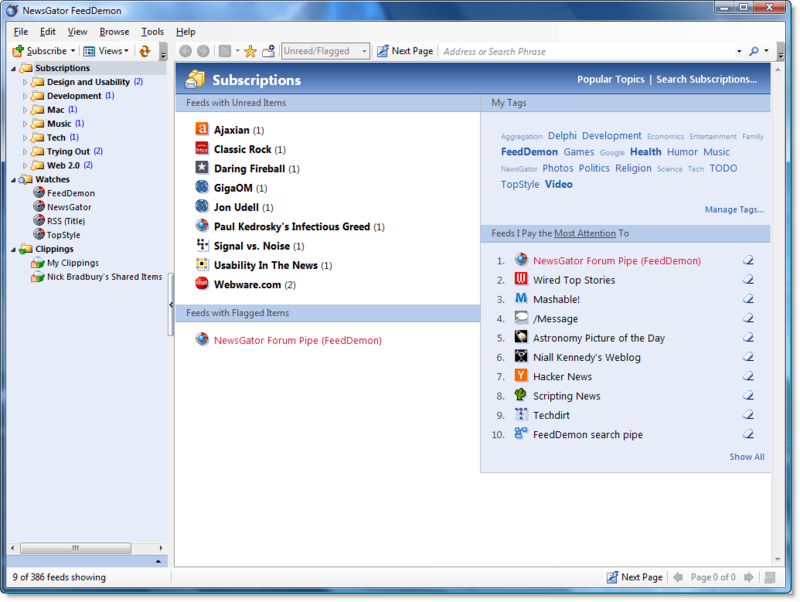 Tags added to posts in synchronized feeds are passed to NewsGator in the background, so any tags you add in FeedDemon will be available in NewsGator Online or any other application which syncs with NewsGator and supports tagging. So, that covers the basics of where FeedDemon’s tagging support currently stands. Beyond these features, is there anything important I’m missing? What tagging features would you like to see? Can we assume it will be two-way syncing on the tags? ie, will tags I create – and the associated posts – at NGO be synced down to FD? @critter: Yes, tags you add to posts in NewsGator Online (or any NewsGator-enabled product) will be synched down to FeedDemon. 1. Tag-tree in left-hand pane. 2. I know I tweeted at you about pre-tagging every post that has tags supplied by the publisher. But now that I realize tags are going to be synched to NG, that pre-tagging doesn’t seem like such a good idea. Unless publisher-supplied tags aren’t synched. Which would mean that some tags are treated differently than others. Which would be really unexpected behavior to the user. However, you could use publisher-supplied tags (as well as popular tags of other NG users) to “suggest” tags to the user when they go to tag a post. Sort of the way the Firefox Delicious bookmarklet works. Hmm… I don’t really use flags, and this just seems to be flags on turbo. I was hoping that we might someday see the ability to tag, or categorize feeds. 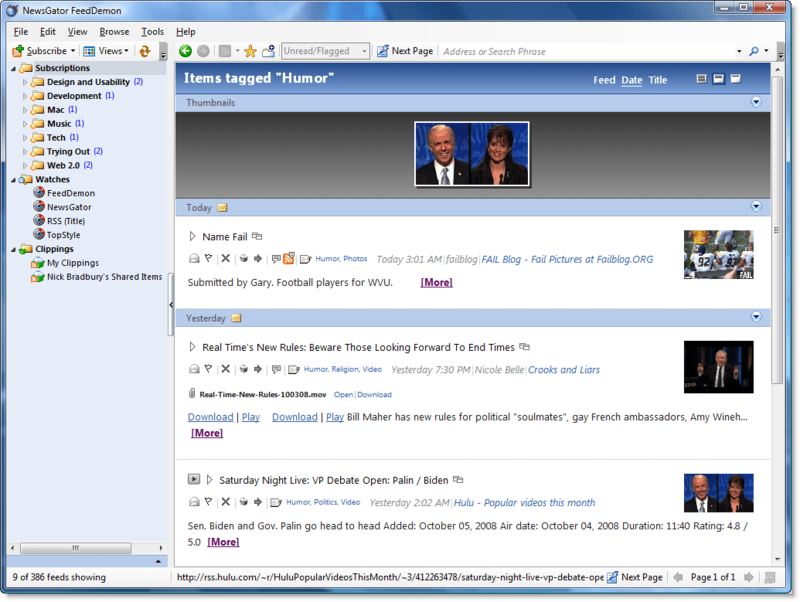 I could put your feed in ‘software, rss, newsgator, delphi,’ for example, and see your new post in any of those categories. The category listing would replace the stock alphabetical folder list. Are you planning on adding a suggestion feature? In delicious, it suggests tags and with newsgator storing feeds… Perhaps if someone has already tagged a feed, feeddemon could use those tags as suggestions. 1) Can the tag cloud be displayed in the regular newspaper as well (or at least let us be able to add it in our own fdstyles. @Dan, @critter, @Matt: Publisher-supplied tags could be supported separately if I made use of the RSS ‘category’ element. A lot of publishers assign categories to their posts, and FeedDemon does store this information – it just doesn’t display it at the moment. I could simply use these categories as suggested “user” tags. Autotagging based on origin feed (like Jack suggests) or article content might be nice, but that would replace the Watches feature for me. I don’t really use watches anymore, because it duplicates content. Auto-added tags on the original articles instead would suit me better, I’d have to mark articles as read only once then. How about dragging and dropping a tag from the tag cloud to the item (and vice versa)? This is the way picture tagging works in Photoshop Elements, though the tags there are in a hierarchy, not in a cloud. It’s fast and has good affordance, I think. By the way, the “Feeds I Pay the Most/Least Attention To” is a feature I pay the least attention to. I’d just as soon have that space taken up by tags (including yet-unused ones). @Rijk: Tagging will likely be one of those features that some have no use for, but others really appreciate. Personally, I’m using it as Jack describes it – like “flags on turbo.” I tag posts I might want to revisit, but don’t really want to clip. And I use specific tags to identify the various categories these posts are in. For example, I have a lot of posts tagged “Video” which (no surprise) embed videos I want to watch later when I have time. Hi Sir! I am very excited about this new feature. One thing, I would like to see, is the RSS feeds for individual tags. Most of us love to share our favorite items with friends by publishing RSS feeds of Clippings folders. I too have created many clipping folders for different purposes. I guess that users will love to have RSS feeds for tags too! I can see why a few people wouldn’t use this feature, but i’d be using this the same way you do (flags on steroids). I never bothered using flags purely because there was no way for me to ‘categorise’ them, instead i created more clipping bins and clipped those articles to there. So i’m really going to find this feature useful because i can do away with all these extra clipping bins and be more specific about how things are categorised. Also as someone suggested, it’d be nice to be able to share out tag feeds to other users, while it’s not necessarily something that needs to go in straight away, it’d definately be a nice feature. Something that i think could make it quicker, is if there was a quick entry box for tagging. I can type the keywords quicker than i can move the mouse to them (especially if they’re auto-completing based on previous tags), so really the lower half of the window seems redundant for me. I see myself just clicking the edit tags (or hotkeying it), typing and hitting enter and the quicker it is at doing this, the more i’m going to use it. It’s nice to see FeedDemon providing another way for us to manage the information overload that RSS can sometimes cause and just as nice to see you checking in with your userbase to see if what you’ve done will work with our workflow (something i’m sure all of us have always been happy to see you do). 1. Automatic RSS Clippings feeding with specific tag (I mean it would be great if I could configure specific clippings saying “feed on this (or these tags) automatically”). I agree with ArpitNext, I deeply use RSS feeds through clippings to serve clients. * when editing tag, have a shortcut and have tag completion when typing it. * planned support also for NNW ? with NGO sync ? A tag view in the left-hand pane would be useful (where the Folders, Watches, Clippings, etc. go.. a Tags folder to collect all items under a tag would be good). I would like to have a TAG TREE also, just like the CLIPPINGS tree. I have one question on something that isn’t completely clear to me from this post. Will tagged posts, like flagged ones, be kept forever and not deleted over time? 3) I second Jul’s request above for default tags for a field – I’d also like to see per post tags that I can add to these. 4) Also second the request for a tag view in the left-hand pane. 5) Tags synced on a per-feed and per post basis to NewsGator online. These would help a lot, I’m trawling through a lot of feeds, and it would be very useful to see the above implemented. Sounds like showing tags in the subscription tree is a popular request – I’ll experiment with this, then post some screenshots if it works out OK.
@Yaron: The way I have it now, tagged posts are NOT automatically purged, and the Cleanup Wizard enables skipping tagged posts. Well, I personally don’t mind tags, but wouldn’t say they are much of a help on their own. More powerful filter system -> Implements among other things filtering based on “keyword” field of RSS feed -> Automatically tags feed items based on “keyword” and/or other filter criteria -> Watches are gone, instead there are virtual tag folders containing filter results. 1. Ability to tag posts without modal dialog. Until FeedDemon won’t synchronize with Google Reader any other features is just waste of time. @Michael Garmahis – well, you’re in luck, because FeedDemon already won’t synchronize with Google Reader.